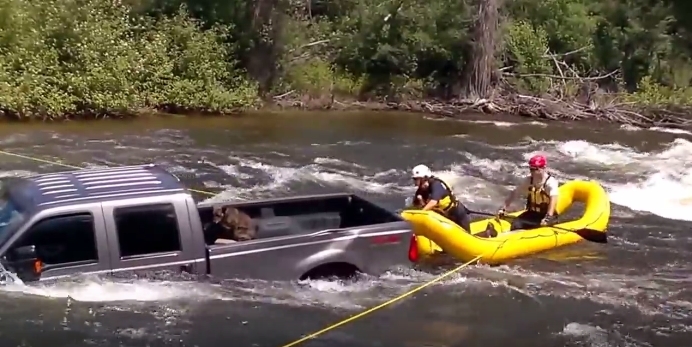 In Winthrop, WA a rescue crew rafts out into the rapids to save a dog stranded in a truck bed. This video proves that there are a ton of animal lovers out there who are willing to help no matter what. The truck in this video accidentally rolled into the river with the 59-year-old driver and her two dogs inside. Thankfully, the driver and one of her dogs managed to paddle to safety, but the other was trapped in the back. Luckily, a group of onlookers sprung into action and quickly got the authorities on the scene. Given the speed at which the truck was sinking, they needed to act fast. In an impressive display of skill, the police were actually able to kayak upstream towards the sinking truck and coax the frightened dog to safety. The police were able to get to the dog before the truck was completely submerged thanks to the quick thinking of those nearby. We are so glad that this dog made it out alive, but this should serve as reminder to all that you never know what could happen if your dog is riding around in the back of a pickup truck. Responses to "Amazing Team Rescues Dog From Sinking Truck Just in Time"
how long should i stay drug-free to start truck driving?